Jane's (i)__________ disposition seemed irresistibly to infect those around her, taking wavering hope and turning it into robust optimism. It was as if in her presence, the silver lining of every cloud became (ii)__________. (C) and (F) are correct. Don’t be put off by two- and three-blank sentences; sometimes, getting to the correct answers is easier than in a one-blank sentence because there are more context clues. Just start with whichever blank seems easiest and work your way to the others. In this question, we can begin with the first blank, an adjective describing Jane's disposition, which must be strongly optimistic if it "infects" others and makes them optimistic as well. Choice (C) sanguine can mean either "reddish" (in regard to complexion) or "confident" or "optimistic" (in reference to disposition, as is the case here). This second meaning matches our prediction, so (C) is the correct response. Choice (B) ruddy, "healthily red," refers to someone's complexion and is incorrect. While (A) sanguinary may look similar to (C) sanguine, it actually means "bloody" or "bloodthirsty," which is unsupported by the context and is thus incorrect. For the second blank, the context refers to the saying "every cloud has a silver lining," which means that one should always look on the bright side of things or see the best in even bad situations. The key to selecting the correct answer here is in the previous sentence; Jane takes "wavering hope" and turns it into "robust optimism." She makes optimism stronger, and the correct answer will reflect this. Choice (F) coruscant, meaning "gleaming" or "radiating," completes the image of the silver lining growing brighter, so this is the correct choice. Choice (D) lacklustre, meaning "dull," is the opposite of what we want. Choice (E) tangible, "corporeal" or "touchable," makes little sense because the silver lining is figurative, not literal, so (E) can also be eliminated. Choices (C) and (F) are the correct answers. Our tour guide was obviously more capable than we thought; after the avalanche, he assumed _______ role, leading us quickly out of danger, checking us all for injury, and assuaging our fright. (D) and (F) are correct. Sentence Equivalence questions can be tricky because they may feature a number of traps. The testmaker may include a pair of synonyms among the choices that do not match the clues in the sentence, or include one word that matches the context perfectly, without a second correct choice to go with it. You need to find the TWO choices that BOTH complete the sentence logically and give it similar meanings. This sentence contrasts the behavior of the tour guide before and after the avalanche. Before the avalanche, the tour guide may have appeared incompetent; after the avalanche, he appeared “capable” because he led the group out of danger. We can deduce that he assumed a “sheltering” role, a prediction that is consistent with the sentence's description of the tour guide's behavior. Both (D) protective and (F) tutelary mean “sheltering,” so (D) and (F) are the correct answers. Choices (A) assuming and (C) pretentious both mean “arrogant,” and (B) guarded refers to “self-protective” behavior; all three are inconsistent with the tour guide's actions and the sentence's description of him as “capable.” Choice (E) moralizing means “to attempt to improve someone’s morals” or “to reform,” which is also not implied by the list of actions performed by the tour guide after the avalanche. The correct answers are (D) and (F). C. The quantities are equal. Start with Column B, as that’s a simple division. Column B = 7. 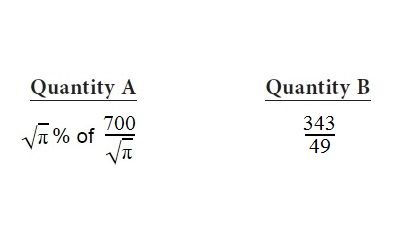 Simplify Column A to find that the two columns are equal: “of” means “times,” so you can rewrite this expression as 700 sqrt(pi) % / sqrt(pi). The sqrt(pi) cancels out in the numerator and denominator, so you’re left with 700%, which equals 7. This question is a great example of the testmaker’s tendency to make the two quantities difficult to compare by making them look different. Your solution to this problem? Make them look alike! Chef James must select 3 different items for each dinner he will create. The items are to be chosen from among 5 different vegetarian and 4 different meat selections. If at least one of the selections must be vegetarian, how many different dinners can the chef create? A preliminary step in solving word problems is working your way through the information provided and understanding what is being asked. This question asks for the number of different dinners Chef James could make. Since the order of the selections in the dinner doesn’t matter, this is a combinations problem. But it involves three possible combination types: Veg, Meat, Meat; Veg, Veg, Meat; or Veg, Veg, Veg. Calculate the possibilities for each type of combination and then add the results to find the total number of different combinations possible. Let V represent vegetarian and M represent meat. Then with V, M, M, he has 5 choices for the vegetarian (he must choose 1) and 4 choices for meat (he must choose 2). So here we multiply 5 x 4C2 which is equal to 30 selections. For V, V, M, he will choose 2 out of 5 for the vegetarian and 4 choices for the meat. For this course he’ll need to calculate 5C2 for the veg selection and multiply that by the 4 meat selections. This equals 40 selections. If he goes with V, V, V, the all-vegetarian menu, he will choose a subgroup of 3 from among 5 vegetarian choices. This is simply 5C3 = 5*4*3 / (3*2) = 10 selections. Add this up to get the answer: 80 selections. You could have also gotten to the answer by finding the total number of choices and removing those that are not possible. If there were no Vegetarian limitation, then the total number of meals that you could create would be 9C3 which is equal to 84. The only meals that are not possible are the all-meat meals. Find the number of those by calculating 4C3. That’s equal to 4. 84 ﹘ 4 is 80. Points on Test Day! GRE® is a registered trademark of the Educational Testing Service. Kaplan is neither endorsed by nor affiliated with ETS.